A timely first point I’d like to make is that this ClearCruise feature — which was rather quietly introduced at the 2017 Miami show with several other significant products — is not the same as the new ClearCruise Augmented Reality that Ben Stein just wrote about. 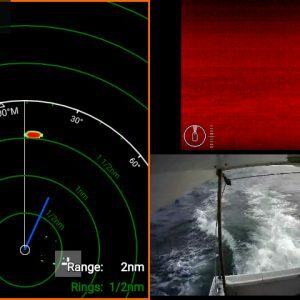 While both features are exclusive to certain Raymarine MFDs, they work with different types of cameras in different ways. I think that both technologies are valuable and I strongly suspect that they will evolve together as Ray and Flir clearly blaze trail in advanced navigation imaging. Above is the same FLIR M232 camera view at full screen a few minutes later, and the two bracketed objects correspond to the two radar targets at about 1/4 mile range to starboard of the blue COG line that shows Gizmo’s actual course (while the yellow Heading line is way off, an intermittent annoyance likely due to an overly complex NMEA 2000 network). 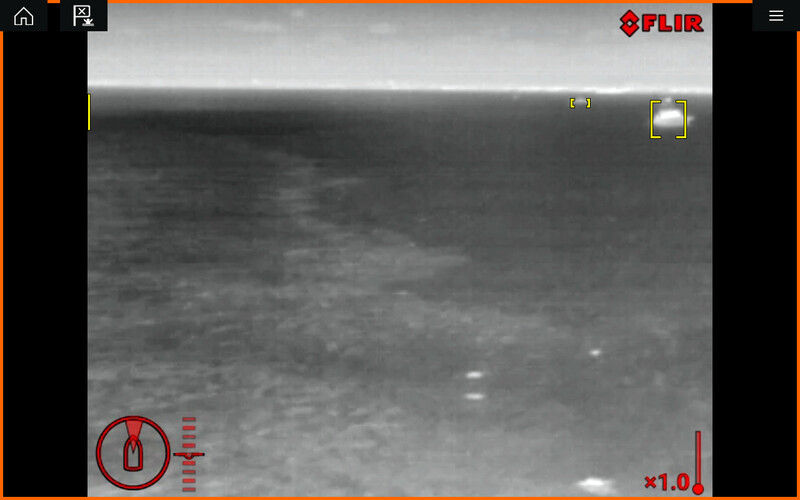 One is obviously a boat passing well to starboard, and it would be especially nice to get such visual confirmation in pitch darkness when this thermal view would look the same. But note that the second bracketed object — again a solid radar target at about 1/4 mile — is not yet distinct and that the big targets at 1/2 and 3/4 mile ranges don’t show at all. I’m pretty sure that’s because the FLIR M232’s image resolution is only 320×240 and given a field of view 24° wide and 18° high, it’s very difficult to capture distant detail. 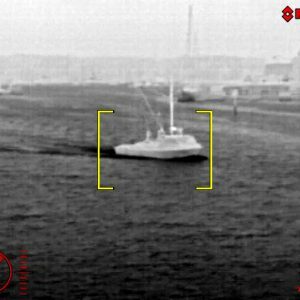 By comparison, check the 640×480 resolution FLIR M-618CS thermal images that were once available on my testing boat, but keep in mind that a 618CS then cost about ten times what the M232 does (at $3,500 retail)! 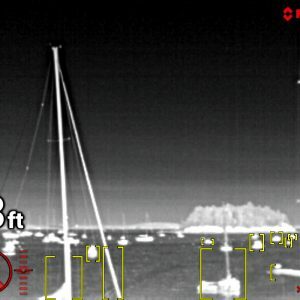 While I’d rather have the higher resolution thermal camera up on Gizmo’s mast, it’s impressive how much ClearCruise helps to overcome the 632’s limited eye for detail. That second target above, for instance, could have been easily missed without the yellow bracketing, and I’ve often seen vague but highlighted targets like that become something of note as I got closer. Plus, if you want, ClearCruise can even beep you each time it detects a floating object. 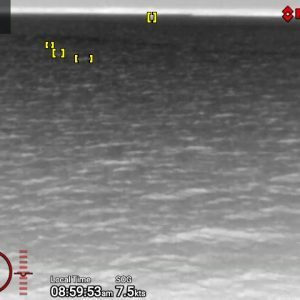 In fact, it seems a bit odd that FLIR’s least costly marine navigation thermal camera is the first to have such a sophisticated feature. But apparently that’s due to a new Boson camera core with lots of built-in processing power, and the relatively low camera resolution probably helps. 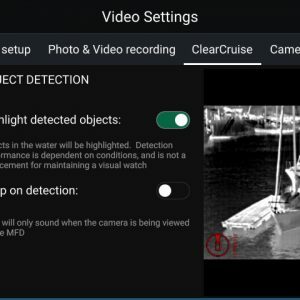 That’s because the ClearCruise “thermal analytics” are constantly scanning the video stream — think (320×240=) 76,800 pixels at 9 times per second (9Hz) — trying to identify solid objects in the water while also filtering out what’s ashore. It’s a task that seems much harder than the motion sensing seen in so many security cameras, since the boat is also moving and so is the water surface. And while ClearCruise is a little jittery and sometimes gets confused in my experience, it’s still a pretty amazing and useful feature. Check out this demo video for a fair presentation of what it looks like live, and then I’ll show you how it operates on Raymarine MFDs, with more ClearCruise examples and other M232 features included. First, I’m happy to report that the FLIR M232 works the same way on the Axiom 7 and eS128 MFDs networked on Gizmo. There was some confusion and pain when it turned out that the LightHouse 3 operating system introduced with the Axiom series could only be made backward compatible with the existing eS (and gS) MFDs, and even then with some features missing. But the system I’m testing — which also includes a CAM210 IP and a CP100 sonar — all works about as smoothly and quickly on the eS as on the Axiom. So at top left is the main menu I get on either MFD, and while it shows some specific commands for the pan-and-tilt M232, I can also use it to switch over to the fixed CAM210. But you do have dig deeper to access the ClearCruise menu at upper right, and that’s especially unfortunate as object detection is always off by default. I’d like LightHouse 3 to remember what the ClearCruise setting was when I shut the system down, or, better yet, put the on/off switch in the top menu or right on the imaging screen. And I’m hopeful about the latter because the new ClearCruise AR has useful onscreen touch controls, as you can see in this nifty online AR simulation. The two bottom screens illustrate a typical open water ClearCruise sequence. The nearby bracket group was jumping around a bit and never seemed to mark objects of real substance, but the far bracket was steadier and indeed turned out to be a large nav aid I wanted to find (but not hit). The overall effect is what I call “jittery” and false positives are not uncommon, but then again I’ve used this same viewing angle — aimed just above Gizmo’s bow rail — to spot lobster pot buoys in the dark. 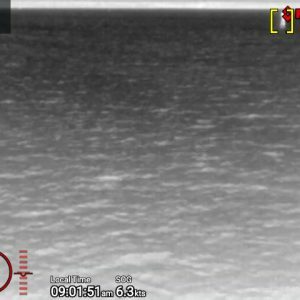 The top left screen in this set shows how LightHouse 3 can window multiple live camera feeds, and also that the M232 is not showing a ship target at 1.5nm. In this case, I believe the problem was not just low resolution but also fog. While a true thermal sensor like this doesn’t need any light at all — and “night vision” is different — water in the air, be it for or rain, does block thermal waves. Two screens illustrate ClearCruise in busy harbors. The bracketing can get quite busy — one good reason for an onscreen on/off switch — but note how the analytics can usually distinguish free floating objects from stuff around and above the shoreline. In the lower left scene, I was working at anchor in Solomons Island but using the ClearCruise beeper to get notified about passing boats. The current thermal ClearCruise can not highlight a vessel moving toward you like Doppler radars can, but I suspect that will be possible eventually. 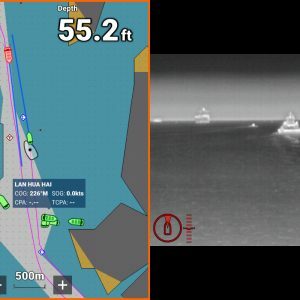 With the new Augmented Reality feature, Flir and Raymarine are already showing how objects with known chart locations — like AIS targets, nav aids, and waypoints — can be located even in a high-resolution camera image, so maybe AR features will come to FLIR marine thermal imaging? 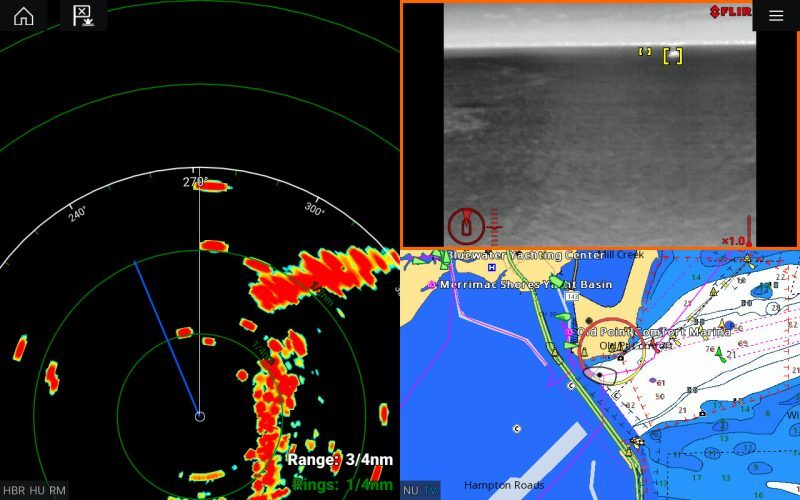 And then once Raymarine figures out how to reliably turn moving Doppler radar objects into precise ARPA targets (like Furuno NXT already does), can’t they too become an AR option? Of course, it’s a whole lot easier for me to noodle about possible future electronics features than it is to actually create them. But behold the screen above. Taken during beta testing of LightHouse 3.7, it shows how the original thermal ClearCruise is getting a range estimation option. 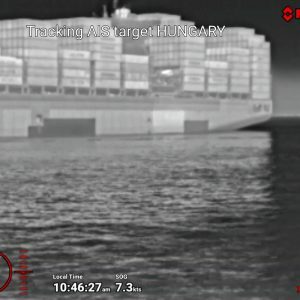 It’s something like the range estimation in ClearCruise AR, except in that case the system knows the exact location of the object and your boat as well the camera’s spatial dynamics and its height off the water, with the results apparently smoothed with the required AR200 Video Stabilization Module. 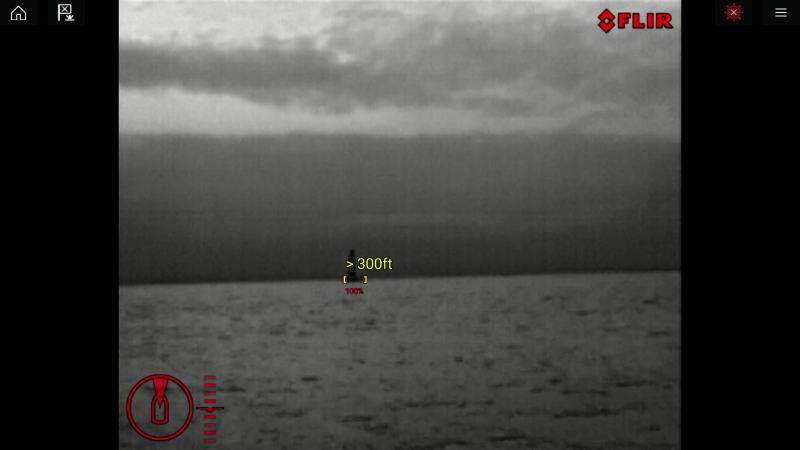 By contrast, the new FLIR M232 thermal camera range estimation must be using the object detection, and maybe even horizon detection, to do the job. 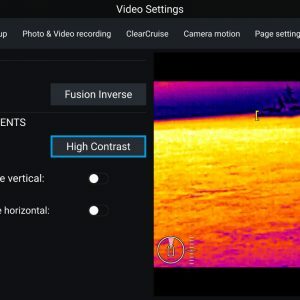 In other words, the developers at Raymarine and Flir — and at named partners like Utopia Compression — apparently have numerous video analytic tools at hand. 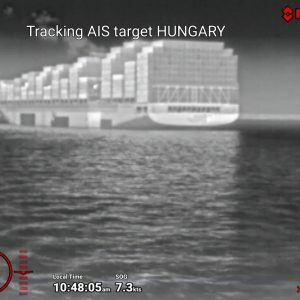 How would you like your (marine camera) reality augmented? Now no doubt some readers are just seeing video-game-like distractions on these screens, but I caution against judgements before spending some time underway with fairly radical developments like this. 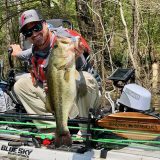 After all, in this case we’re talking about screen enhancements that can help you keep your head out of the boat and not look at screens as much, if they work right. I’ve seen ClearCruise object detection work well enough in many situations, and I look forward to trying the new range option — soon, I’ll report back — and eventually AR. I’d be remiss to wrap this up without touching on some of the many high-end FLIR thermal camera features that were not left out of the relatively low-end M232. I tend to favor the grayscale palettes, for instance, but I often use black/white hot and contrast adjustments to get optimal imagery in the given conditions. I also found the surveillance scan useful. The M232 even has a built-in heater to help with lens fogging and it was easy to install (as I described here). 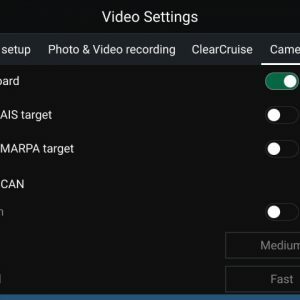 My favorite feature, though, is how the camera can locate and lock onto almost any object I can see on the regular navigation screens, like nav aids, charted ledges, and most especially MARPA and AIS targets. And I believe that this and most all other M232 features — ClearCruise excepted — are available when the camera is used with other brand MFDs. There’s also a tilt-only M132 that can do a lot looking forward and it’s no wonder that I’ve seen many of these compact and more affordable FLIR cams along the coast. I am loving the trend of all of these disparate technologies finally being unified by software. 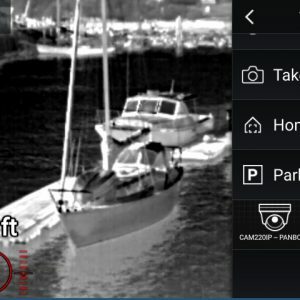 Using cameras and logic within the MFD to track objects, overlaying AIS target information on the screen, and the full augmented reality functionality in LH 3.7 are just the first examples of what this sort of tech can bring to boating. Seeing all of the press around AR in the last year in the tech world is interesting, but many of the practical applications are game focused, or on weird niche markets like watching airplanes fly by (which I do a lot!) and not really useful day-to-day. The new things that Raymarine are focusing on will probably seem common place in a few years, and definitely will contribute to more visibility and safety on the water. …and that maybe you have already purchased a “stinkpot”? 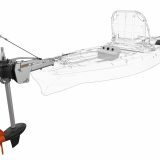 I’d like to welcome you enthusiastically to the practical side of rec boating and I very much look forward to hearing about your new ride. I am moving to the dark, comfy, and far less compromising side of the boating world! What I can say is that Grace is days away from closing and moving on to another family, and I am under contract for a wonderful Ocean Alexander 46′ yacht, and very excited about the possibilities. I am very excited about having more room and power to do even more techy fun stuff on the boat! I can’t wait to share more about the new platform!!! That is pretty cool technology. Looking forward to even more integration and features – Raymarine has impressed me in the last 3 years in their innovation, new ideas, and in particular in their focus on User Experience, which the other folks could really learn a lot from. 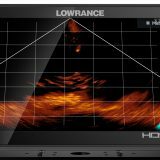 Talking with a Raymarine rep the other day, it is my understanding AR will be coming to Flir cameras, but no timeline given. They must be IP cameras to properly interface with the AR200. I was definitely given the same impression. Apparently the biggest challenge to getting AR on the FLIR cameras is accounting for their pan and tilt capabilities. This movement adds two more dimensions to the calculations that must be performed to correlate the location of objects with the displayed image.